What every city needs is a pool hall that cares. (We didn't realize that either, but websites never lie.) So Tucson is fortunate to have Clicks, a fixture on North First Avenue for years. A full-featured game room including foosball and darts, Clicks re-covers its pool tables every month, guarantees no crooked cues, and, gosh, does it have balls! The bar offers specials throughout the week, and the kitchen offers a substantial menu and also imports sandwiches from Sausage Deli and pizza from Blackjack down the road. 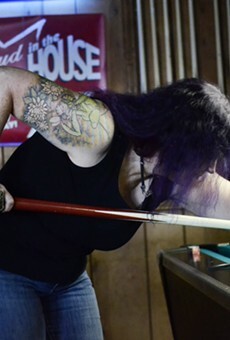 There are leagues, numerous opportunities to play pool for free (or really cheap), and they also host the Poker Pub's free Texas Hold-em tourneys. Just as they claim: "Clicks cares"—about your cues, comfort and competitive spirit. —Thanks for representing the Eastside: One vote for "Thirsty's"